Having touched the highest peak in our journey, one can consider it would be a cake walk from then. But, our organizer Wangchuck had arranged for a drive specifically for this day, a 21 km walk. We all were given a choice – 14 km drive and then 7 km walk; or walk throughout. Geetha Aunty and I chose the jeep straight away. Sandhya aunty and Jayati aunty told their decisions later in the morning. So it was a 4 people with Norbu in the jeep and the rest 8 with Pemba by walk. So we got ready – standard wet wipes and facewash routine – and after breakfast of “I don’t remember what” (I’m sure Amul cheese spread, homemade jam, porridge was in the menu), we started off split in 2 groups. One km of drive later, we met the walking group on the way and went past them, waving goodbyes, This might have shattered the plans of those who were counting on us starting late and meeting them 4 – 5 kms down the lane, where the tired ones could take the jeep. The jeep drive turned out to be equally interesting as the walk might have been. The road was totally bumpy (I call it a road for want of better term) and the previous day’s rain had washed away mud on the way and on the whole made the route un–jeepable, especially with people in it. So there were these stretches of few metres that we opted to, or rather had to walk. It was a great time to pose and take pictures and admire the beauty of the mountains. There were 2 other people travelling with us apart from the experienced young driver and Norbu. And they were there solely to help even out the route for the jeep to ride on it. We did not know initially they had come all prepared with spades and stuff, but it was a sight in itself, watching them jump out of the jeep time and again and working with spades and shift rocks. We stopped at a remote hut in the midst of nowhere for tea, rest and rest room :P. After the rest was the 7km walk. The sun was up and shining – the perfect timing to click pictures. Sandhya aunty went ahead looking for views. And I clicked at practically everything I saw. There were poppy pastures, winding roads, trees struck by lightning, yaks and joes, rhododendrons… And lo – the mist is back again. Made me pack and put in my camera back into my jacket. Something to note here is that we stopped carrying bags from this day. Its jacket and pant pockets for the barest necessary stuff to be carried on self, and the walking stick if necessary. We reached the cottage – our first Indian stay since Darjeeling, and it was already drizzling then. It was FREAKING cold and I felt feverish. So I skipped lunch (did not miss anything coz it was just noodles) and snuggled into my sleeping bag. They gave me a makeshift hot water bag – a Bisleri water bottle filled with steaming hot water! It was a blessing at that point of time, believe me!! Later, we all took refuge in the kitchen, which had a comforting fire burning for cooking purposes. I used the time to take notes for future as to what happened each day, on the back of my air ticket print out. Around 5 PM, the rest of them walked in one by one, and they had another post worth stories to tell. I ain’t going into detail here, but I shall tell you one instance. The kids had decided to fool Pemba, who was the guide who went with them. So they all walked ahead and hid from sight before Pemba walked up. It seems he went about shouting their names and got scared. Then these evil plotters came out from their hiding places and they all started laughing. Good that Pemba took it as a joke 😉 Back in the cottage, one line unanimously agreed by all the walkers was, “T’was one helluva walk”. If I forgot to mention the dinner that day, it would not be a completed narration. Something we had all been wanting to have ever since we stepped foot on Darjeeling, something we kept asking time and again for dessert. We had finished the main course – rice again – and Pemba announced it was gulab jamun for dessert and went in and got a huge container, a wide grin / smirk on his face. And there it was! The treat – RASAGULLAS!!! Yummy, delicious, give it twenty more adjectives 🙂 🙂 We were able to get around 2 – 3 each. No electricity for that night; no mineral water either. I tasted mountain water for the first time – it had somewhat of a charcoal taste. We were given candles and spare blankets for each room, which was a 4 bedded one. We did have a Spare Oom (spare room) – wonder if it had a Narnian wardrobe in it. Well, we have already been having enough magical stuff around us, so it didn’t really matter! This was THE day – the day when we walked upto Sandakphu (3636 metres above sea level) – the highest we were going to reach as a part of the trek. And so obviously it was a steep, yet short climb of 7 kms. We started the walk in the misty background after a yummy breakfast of Tibetan bread, porridge and puri. We all had our rain gear out and prepared for the rain. Otherwise, our strategy that day was to stay light, take the necessary stuff (food, medicines) in pockets, and no bags. In the first lap, we met some kids walking to school… Imagine walking a couple of hours to study, at the age of 7 or 8! The kids looked so cute with pinkish cheeks, like an excess of rouge 🙂 We took pictures with them and then bade goodbye. The way was decently uphill all the way, but I had expected worse; and so it did boost my morale 😛 I had planned and got diversions to ease the walk – my MP3 player. So I walked with music for my company most of the way. The mist kept clouding and clearing at irregular intervals, and I tried to take pictures whenever possible – the Joe, the paint markers on the road to show the way, a little difference in terrain (after a point of time it will be all green, brown and blue to you). As expected, the rest of the group had gone a litte ahead and reached the only stop point for the day – a small hut @ nowhere. As Geetha aunty and I walked in few minutes later, Tejasvi welcomed me with an energy bar. We all had black tea and pineapple juice. EB started playing with the kitten and the hens, and I took pictures of them as well. We stated our walk on the second and last lap towards destination Sandakphu. Let me describe the path to you. There will be as many hairpin bends as possible (and I was thankful I am not taking this route by vehicle ;)) whenever the mist clears out, you can see most of the trail ahead or atleast the mountain that you will be crossing in sometime; not very lush greenery, more of gravel and pine trees; and then the seats! That was one of the most welcome sights – the seats. 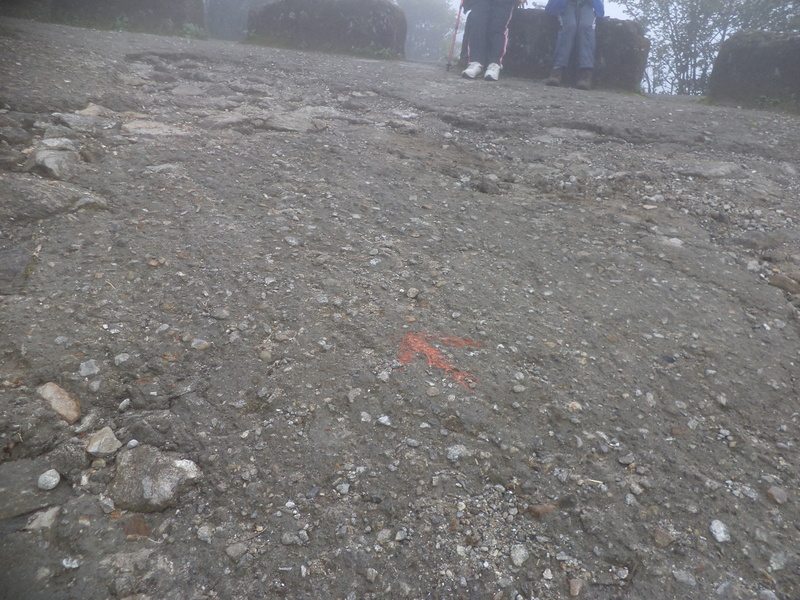 There were cemented blocks at regular intervals at the edge of the road, probably to prevent from falling off. But we used them as resting places and they were rightly spaced for that requirement. I developed this rule for myself – 20 steps of walk, 2 minutes of rest. After about 3 kms up, I had to give up on my rule. Reason being, insects. You see, for a climate that cold, I think any being would be attracted towards warmth, and me sitting on moss covered blocks of cement was exactly that. So these insects swarmed each time I sat to take rest, and my 2 minutes of bliss became 2 minutes of torture. And all the way, I kept perstering our guide Norbu with questions ranging from Buddhist monastries, red pandas, the terrain and all that for timepass. As you know, we were in search of the red panda from the day before. When we asked about this to Norbu, he replied (he should have been frustrated with my questions by then), “You want to see red panda? I am red panda!”, pointing to himself (he was wearing the same red t-shirt that day). 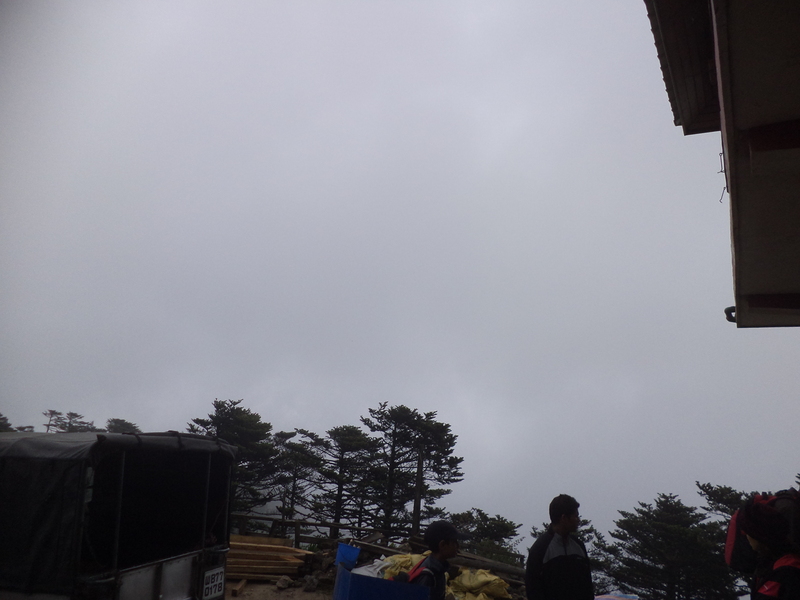 We had almost reached the destination (I saw a milestone saying Sandakphu 1 km, which was concrete proof! ), and the rest of the path was full of steep ‘S’ bends. As I walked up resting every few steps, (I was ravenous by then) this foreign lady walked past me, took a steeper short cut next to the usual steep route and vanished out of sight in a few seconds. She walked as easily as on a plain!! I just stood there, amazed. To top that, when I reached the clearing where the guest houses were located, I saw her sitting on a bench casually, waiting for 2 other guys who were coming behind me.!!!!! I reached the cottage and went into the first room. Most of the group was sitting there and listening to what seemed to be a deeeeeeeetaaaaaaaaaailed narration of the Mahabharatha by Rohan. That was when I came to know that these guys had started the story an hour back during the walk. Next up, the group splits into two, and we have some very interesting experiences on both ends. Day 2 dawned as a relatively clear day, and I woke up with the background music of dogs barking. The sound kept on increasing and later I came to know the reason for it. The dogs had had a ritualistic welcome for each new dog that entered the campus. They would bark and run upto the front gate to greet the new dog that comes, and by the end the number of dogs had gone upto 6. We woke up and had black tea. Then me, Nishanth and EB decided to go on a walk. We went upto this hill peak which apparently served as a watch out point with traditional flags mounted. From here, we could see most of the village and surrounding mountains for a few seconds after which the mist took over. But the picturesque view was worth the extra uphill climb. We walked back to the lodge chatting about random school stories and missed the cut that goes to our lodge. When we had started a construction site came in view a minute later (I remember commenting how they actually transported the materials to build). But on our way back, we missed the construction site and walked straight ahead. It took us a couple of minutes to collect our thoughts and trace our way back to the small lane that led to our cottage. Back to the room, we did the repacking routine, had a breakfast and then started on a 11 km trek from the Shikker Lodge. The first lap was surprisingly downhill and me and Lavi started singing “situation songs” as we walked. We sang from “pudhiya vanam”… to “pulveli pulveli”… “oho megam vandhadho”… and the likes, you can imagine the rest. By midday, I realized you cant have an altogether pleasant day at the mountains. We started with a slightly uphill slope which constantly steepened as the guys chose the jungle path. We had been offered 3 choices earlier that day – the Indian route, the Nepal route or the jungle route, the last one being steeper, but you could sight red pandas if you were lucky. The jungle route it was. I started pretty bad, the rain gear was not comfortable and the terrain was not good enough to wait and change. So I ploughed on with some help from Nishanth and Norbu. We had a steady lookout for the red panda as well. To top it all, our usual trouble maker paid visit – yes, it started raining again, more heavily this time. 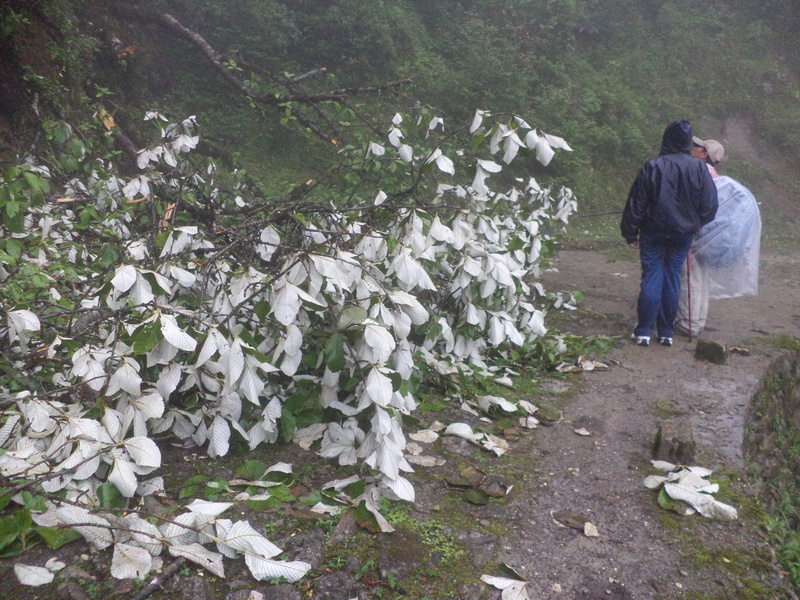 About half hour up the jungle route, we saw Rohan and a couple of others waiting for Norbu who had their raincoats in his bag. We all moved on, me keeping the tail and in few minutes they had all gone past. On the way, we met a group of school kids trekking, covering themselves in pink plastic covers for rain. We spoke to the fellow trekkers, and came to know that they were from National Public School, Guwahati. I remember the teacher telling me, “Madam, you are not supposed to drink water like that here. Have it in your mouth, raise the temperature and then drink… Else you might get tonsilitis”. Actually, I did not know whether to laugh or take it seriously! Our guides proved their excellence again – Norbu distributed plastic covers – 2 for each – to be worn between the socks and shoes. Something to protect from the rain in future, because we had wet shoes again that day, and nowhere to dry them! Day 1: The actual start of the trek, prior to which was the scary 2 hour drive uphill (scary to those who have motion sickness, which is pretty much everyone in my family!) So after tea and bath (the last we could have on civilized place for quite some days after that), we sat to decide on what to take and what to leave behind. The plan was to leave behind stuff that would not be used during the trek (especially suitcase type of luggage, as the ponies will not be able to carry them) and they would be directly sent to our airport on the last day. So we rearranged all our luggages, but Wangchuk was still taken by surprise at the number of items cumulative that the horses had to carry! I guess it came to around 25 when he had an estimate of 15. Still, he managed the number very well and the 12 plus one guide started to Maneybhanjang, the starting point of the walk. The climb was entirely uphill with full of bends, and I felt so relieved when it was over. Then the helpers downloaded the luggage from the car and uploaded it on the ponies who were to carry it for the rest of the week. At this point, we were also joined by our second guide Pemba. Now a quick word about our guides – both of them were pro, Norbu was the silent, background person whereas Pemba the witty, thoughtful one. So we had breakfast at a cottage in Maneybhanjang – tea, bread and porridge – and then started theactual trek.It started with a steep climb up and we all had our walking sticks out. 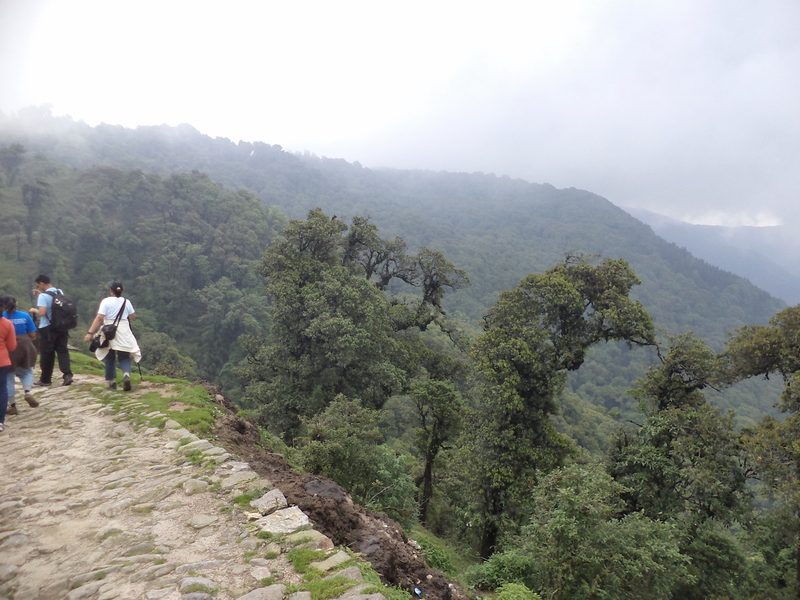 Most of us were still carrying a bag each this day and so the walk was moderate throughout the 7 kms. The rest of the group went ahead, while my aunt, Nishanth, Lavi and I stayed behind. When Nishanth and my aunt were still on their way, Lavi walked steadily and joined the leading group. I was in a dilemma at this stage whether to continue or stay back. Thus I kept at the tail of the leading group, occasionally stopping to see if I can spot Norbu or Nishanth through the mist. Jayathi aunty was there for company for this stretch. We stopped at a lonely hut at a place called Chitre and we were served black tea (again!). Here, we came to know that the road near the hut belonged to India, whereas, the land next to it along with the hut belonged to Nepal! So we all stood in this formation such that one leg was in India and one leg in Nepal and posed for a photo!!!!!!!! Oh yes! Loyala!!! I forgot to mention earlier, but a white dog started the walk with us in Maneybhanjang and came all the way the entire day with the group. It seems its name was Lassi, but me and Jayati aunty named it Loyala in order to pay tribute to its loyalty 🙂 We were hoping it would come with us till the end of the trek; but it stopped at Tumling. We learnt later that this to and fro journey was regular for the dog, and next time someone starts back from Tumling it would accompany them back to the base. We tried waiting for the rain, but it was pouring non-stop, so we continued walking in the rain and reached the lodge at Mt.Tumling numb and wet. Fortunately for us, there was a cozy fireplace in the dining area, and we were able to dry ourselves. And drying, we did – from raincoats to shoes, passports, wallets and jackets… We had a dinner of rice, dal and roti followed by a brief by Pemba. The solar light did not work in our room and we did all the repacking in torch light and then went to sleep on our cozy beds. The day dawned as an average hot Chennai day and I started out to the airport where I was to meet my cousins and aunt. At the airport starts this phenomenon of looking at people’s faces and guessing if it was one of our gang. The fact that I had seen the rest of them only through thumbnail images in gmail till then, is to be noted here. So me, Lavanya, Geetha Aunty, Nishanth, his friend EB (not electricity board, Elaya Bharath :P) boarded the flight to Bagdogra via Kolkata. The rest of the group were to board the same flight at Kolkata which was when we finally got to map the face with the name. We created a ruckus throughout the process, and I am sure the other passengers would have known by then that we were travelling together. Thus we reached Bagdogra and had to go on a 3 hour drive by car from there to Darjeeling, our aclimatization point. We stopped midway at a Cafe where green tea was served. Tired from the drive, Lavi and I decided to stretch our legs and took a walk. The roads look pretty much like Shimla (for those who have already gone there), layers of roads one below the other and rail tracks through it. We got picturesque views but no camera to capture them 😦 Our faces brightened only when we saw Sandhya aunty come out with her cameras. And that is when we knew about the ace photographer in her. As the story proceeds, she proves it time and again. The day ended with an interesting incident – Nishanth, EB, Rohan and Wangchuck got locked out. Apparently Nishanth and EB decided to take a walk at around 10 in the night and found that the gate had been locked when they returned back. Meanwhile Rohan was returning from Wangchuck’s place to the hotel, and they all were stranded outside. Thankfully EB had my aunt’s number and called her to inform. We rushed out, me collecting all the keys available in the reception desk (the receptionist was not there as well) and finally opened the gate for them! I have never done something in my life that requires so much of prep work as this. One of the reasons being, we are totally new to this concept called “Trekking”. Yes, I was invited by my cousin to join this group who were planning to go on a Himalay Trek later this summer. I got the initial details, and was super exited as I love doing these adventurous things. Obstactle #1 started with getting permission from home. Although there is not much dependancy, I still had to convince my people that I will be fine and can go alone. The very fact that this was a new experience, which excited me, scared them. I did all the information scouting I could and gave dad those that sounded convincing only 😉 Search strings included “Singalila Trek route”, “Women Hiker Tips”, “Safety trekking”, “altitude sickness”, and the likes. Dad took a week to give me a go, and from then on, it has been FAQ asking or browsing or buying gear almost every weeked (after considering laziness :P) I will tell you what all I learnt out of this preparation, hoping it would be of some use to the reader. First and foremost was making sure we could reach Darjeeling by flight, which we had to book ourselves. Decent fares were available in SpiceJet and we all ended up booked in the same flight. The guide Wangchuck (I assume) would be taking over from there. The above suggestion was a valuable one, no doubt on that. But beware! I learnt not to listen to all the suggestions I got, which was unfortunately aplenty. So I decided to ignore most of them and just be prepared for what comes along. One very exciting piece of information I got was that I will be trekking partly in India and partly in Nepal, as the Singalila route is situated in both the countries. If only this was true, this is going to be my FIRST EVER time outside India, and I am going to walk, not fly or drive, but walk to a foreign land. Wow!!! Obstacle #3: That was after I got my shoes. Well, we decided that buying shoes should be first on the checklist, as we would need time to get used to it. And lo! First day I wore it and it bit me 😦 Good that it was well before the trip and by now I am used to it. This is a guest article from one of my best and favorite friends, who also happens to be a poet (something I can never be :P)… Kudos, Archu!! On going through a blog triggered me to put up a write of my own. How to start and proceed with the same? I wonder. This is my first attempt on writing after a gap of 14 years. My first story on a cow written while I was in L.K.G still lingers in my mind. It was a short one with not more than 10 lines, a usual story of cow heading into a forest where it faces a ferocious wildcat (tiger). Childhood, a wonderful period in one’s life. A time when one sing aloud, dance in middle of the road; eat ice creams and chocolates mouth full, dripping from one corner of the tender lips, a smile that never deceives any, the touch of those tender hands paving way to happiness to all around. A child keeps the ambience healthy, for it has no negative thoughts in its mind, thus spreading positive energy. It walks around illuminating the path it trodden. The child grieving inside every adult ebb out once associated with a little one. Innocence and happiness unbound and overflow. Love and peace reach its heights. The activities involve spontaneous actions, gestures with full of zeal. So is the quality of a child that one would prefer to stay in that world as one grow and move on in life.